Samford University journalism professor Clay Carey’s 2017 book, The News Untold, has earned the Association for Education in Journalism and Mass Communication’s (AEJMC) Tankard Book Award. AEJMC is the oldest and largest alliance of college journalism and mass communication educators and administrators. The annual Tankard Award, presented at the organization’s annual conference Aug. 6-9, recognizes the best research-based book about journalism published each year. 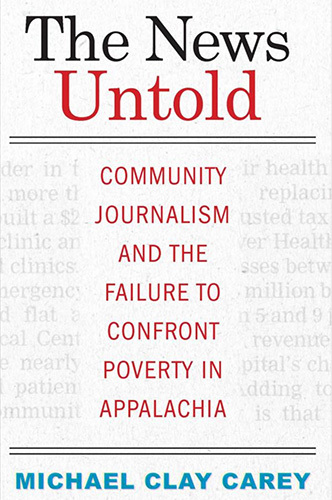 The News Untold focuses on how small-town reporters and editors in some of Appalachia’s poorest communities decide what aspects of poverty are news, how their audiences interpret those decisions, and how those two related processes help shape broader understandings of economic need and local social responsibility. "It was an amazing honor just to be included among the other great authors who were nominated for this award, and it was even more exciting to be the winner,” Carey said. “I'm very grateful to AEJMC for the recognition, and to the many people who supported me and provided guidance and advice as I wrote the book, including my colleagues in the Journalism and Mass Communication and Communication Studies Department at Samford."